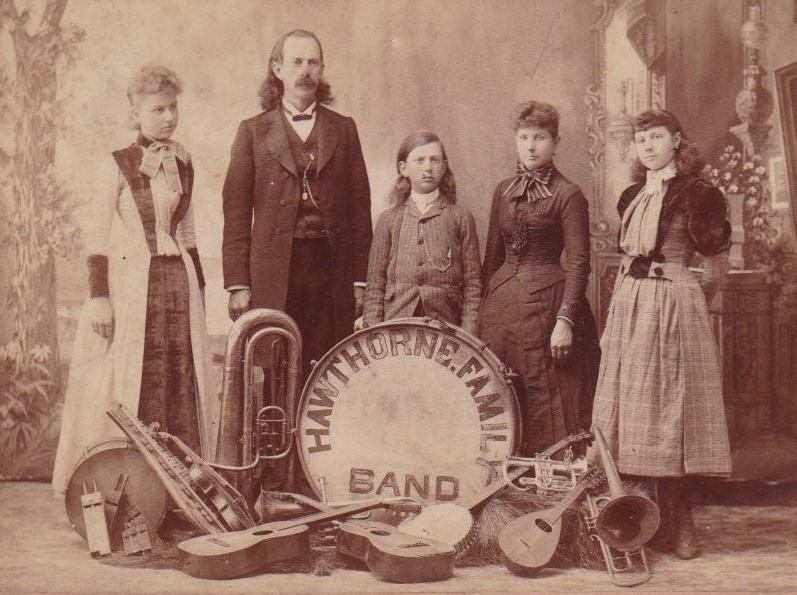 Family bands like this were very common back in the day. This is what happens when there is no TV or i-Pads around to stare at. Examine the selection of instruments carefully. They reflect what was going on at the time. Lots of stringed instruments, and then the tuba, cornet and the valve trombone. This was the era of the mandolin orchestra, the banjo band, and town bands playing in the gazebo on Sundays. I too would love to hear what they sounded like. I’m guessing it was Dad who played the brass instruments and the young man that handled the percussion. It was common for young ladies to play the banjo since this had been promoted by the S.S, Stewart Company since the 1870’s. At the time, there were many instruments that were thought of as gender-specific. A carefuyl study of the photo will reveal a lot about who this family was and maybe even some idea of the music that would have been deemed proper. I get a kick out of my wife owning an SS. Stewart “American Princess” banjo. It was one of the lower price S.S. Stewart ladies banjos: a slightly smaller pot and scale and the hooks that don’t extend past the back of the rim so they don’t get caught in your clothing.